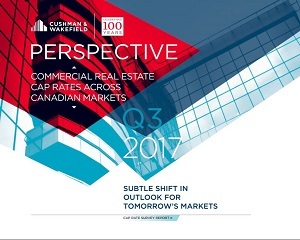 Demand for commercial real estate from domestic and international investors will remain robust through next year, according to a Cushman & Wakefield report on capitalization rates in 11 Canadian cities. The Cushman and Wakefield Q3 cap rates report. All indications are that momentum will carry through into 2018 and create another strong year for CRE investment. While there may be constraints from what’s made available for sale, and rising interest rates could pose risks, fundamentals are strong across multiple sectors and momentum has strengthened within such key segments as suburban office, according to Cushman & Wakefield national research director for Canadian markets Stuart Barron. He expects 2018 to be “another banner year” for Canadian commercial real estate sales. “We will also see greater scrutiny as investors ensure they are adequately diversified, and secondary markets and geographic locations may be in vogue as investors seek to maximize their overall portfolio returns through 2018 and 2019,” said Barron. While the Bank of Canada implemented its first interest rate increases in seven years earlier this year, they still remain near historic lows with an overnight rate of one per cent and have had little impact on the high demand for Canadian commercial real estate. Rising interest rates are acting as a counterweight against strong fundamentals in heated markets, and cap rates across asset classes such as central business district office and industrial are slowing their descent, according to the report. “In Vancouver and Toronto, the outlook for further cap rate compression has decidedly shifted from downward to stable for these asset classes as we look forward,” said Barron. The narrowing spread between cap rates and the 10-year Government of Canada bond yield is causing investors to look at markets and asset classes where returns are potentially higher. As a result, these markets could experience further modest cap rate compression within this rising interest rate environment. Markets like Winnipeg could see further compression in hotel cap rates on full service downtown product, according to Barron. He added industrial product in some secondary markets like London, where fundamentals have strengthened over recent years, continue to have an outlook that suggests further compression is possible. Specific marquee buildings in gateway cities could buck anticipated trends, however, and hit new cap rate lows.